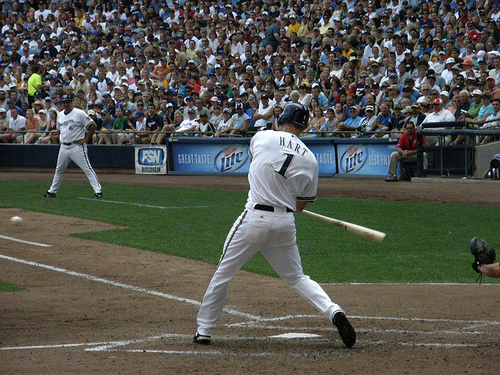 If Bowling Green native Corey Hart has his way he won’t be staying with the Brewers only through the end of the season. Adam McCalvy of MLB.com reports Hart wants a contract extension since Milwaukee decided not to trade him before the deadline. Chad Bishop of the Bowling Green Daily News reports Warren East High School rising senior pitcher/third baseman Mark Biggs has committed to play collegiate baseball at the University of Louisville. The Lexington Legends made several important roster moves over the weekend, headlined by the promotion of South Atlantic League all-star infielder Jose Altuve to high A Lancaster. Infielder Barry Butera switched places with Altuve, moving from Lancaster to Lexington, and infielder Jimmy Paredes, acquired by the Astros in the Lance Berkman trade with the Yankees, was added to the Legends’ roster. John Manuel of Baseball America profiles Paredes in his breakdown of the Berkman trade. Western Kentucky University has announced a showcase for high school players for September 5 at Nick Denes Field. In case you are still a little fuzzy about how major league players can still be traded after the July 31 “trade deadline” check out this very useful explanation of the process from the always great MLBTradeRumors. Josh Cook, writing for the Courier-Journal, recaps the Louisville Bats Saturday win over Louisville natives Marty Popham and Jeremy Sowers of the Columbus Clippers.